An Electric Eel / Drain Snake is a very old fashioned tool that was designed in the 1920’s and was used to unblock clay pipes at the time. Although it was invented nearly 100 years ago, many plumbers still use them today because they are cheap to buy and maintain. Electric Eels are still capable of clearing some blocked drains, however they are not nearly as efficient as the newer technology such as a Jet Rodder / Water Jetter that are also available to plumbers today. A Jet Rodder / Water Jetter, has a flexible hose that is inserted down the pipe to where the blockage is located. 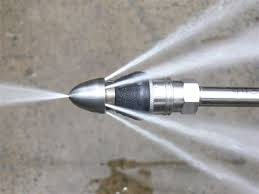 It then pumps high pressure water through the hose and out a specialised nozzle attached to the end. The water blasts through debris and blockages (even tree roots) and cleans the pipe as it goes. It is a very effective tool because it does not work on friction and therefore does not damage the pipe like an Electric Eel often will. What Unblocks a Drain Quicker? Electric Eels often struggle to remove sewer blockages such as tree roots and silt built up in the pipes. Particularly bad blockages can often take up to 8 hours to clean with an Eel, and sometimes they are not able to clear a blockage at all. Jet blasting can usually clear a blockage in less than a third of the time it takes an Electric Eel. Although a Jet Rodder may cost more per hour it usually takes a lot less time to complete the job and therefore is cheaper in the end. What Cleans A Drain Better? An Electric Eel works by punching a hole through a blockage with a coiled cable. That often gets the pipe flowing again. However, because it is unable to clean out all of the debris right to the edges of the pipe, the drain usually blocks up again in a very short period of time when using this method. Because a Jet Rod uses high pressure water, it blasts through the blockage as well as scrubs the walls of the drain pipe, making it like a newly installed pipe. Ensuring a long lasting clean.